CHICAGO, IL--(Marketwired - May 15, 2014) - In an effort to counter the recent surge in violence across the Chicago land area, both the Steve and Marjorie Harvey Foundation and Project H.O.O.D. have collaborated to rally and empower communities to become the solution they so desperately need by challenging 5000 men to cover 500 blocks, every weekend for the entire summer. 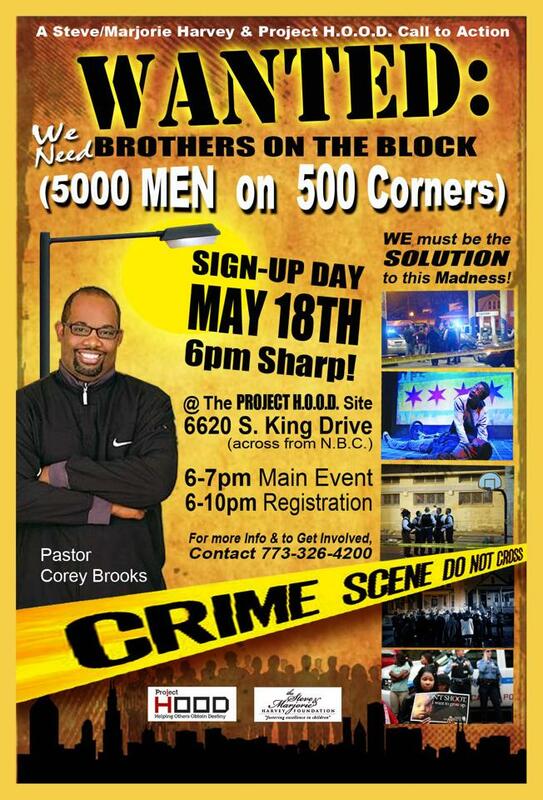 Event Kick-Off: Sunday, May 18th 6:00pm - 7:00pm - Strategic information will be shared with the attending media and the participants, including the future training time and location prior to the Brothers on the Block Occupation. Location: Project H.O.O.D. Headquarters - 6620 S King Dr. - All participating men are asked to register their information and block location. NOTE: Registration is ongoing throughout the event and will continue daily from Monday, May 19th - Wednesday, June 4th from 9:00am - 9:00pm at the registration tent at the Project H.O.O.D. Headquarters. NOTE: This will continue every Friday until August 29 at 9:00pm. Pastor Brooks and Project H.O.O.D. have been relentless in the pursuit of a non-violent Woodlawn and Englewood, where in times past, violence was all too common with no attention, no awareness or action to stop it! Pastor Brooks believes through collaboration, the galvanizing of the private and public sectors plus faith based initiatives a difference can be made. Project H.O.O.D. is charged with stopping violence one neighborhood at a time by Helping Others Obtain their Destiny! About this company Project H.O.O.D.